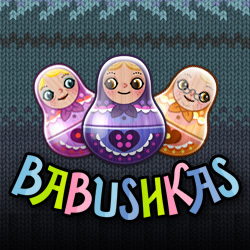 Babushka online slots casino game is based on the Russian nesting dolls which fit inside one another. An unusual themed slot set on a backdrop of hand-knitted jumper and set to appropriate music that transports you to Russia.The background and the dolls change colour during wins and gets the dolls jumping and sparkling on screen. Founded in 2012, Stockholm based independent game developer, Thunderkick, has offices in Sweden and in Malta. They are a company with a passion for quality and entertainment. Great at innovation too, they aim to use 3D real-time graphics in their games. Babushka online slots has a 5 reel, 3 line, fixed 17 payline format. There are no ordinary playing cards in this game. There are seven Russian dolls of varying colours and size and also different facial expressions and you can also tell them apart by the number of dots on their chests a bit like dice (although there is a doll with no dots on). So the paytable increases in value counterintuitively from doll 6 at the lower end of the paytable to doll 0 at the top end. Clickthe hatch symbol and then the document to view the rules or the prize cup to view the paytable. Click Bet to choose your bet (from 0.10 to 100.00). After a win, if an upgrade to the next level of symbol will trigger another win, the symbols in the winning payling automatically updgrade to do just that. If all symbols on the screen are the same value once win symbol upgrades take place, they all upgrade once more, offering the potential for bigger wins. If you’re lucky and you see the highest value symbol covering the screen, you can win 100 times your initial bet. Babushka online slots casino game is a unique game experience and if you are a fan of Russian ambience, you’ll love it. It’s simple to play and easy on the eye. If you like it and want games with other national themes, you might likeThunderkick’s Esqueleto Explosivo which is based on the Mexican Day of the Dead.